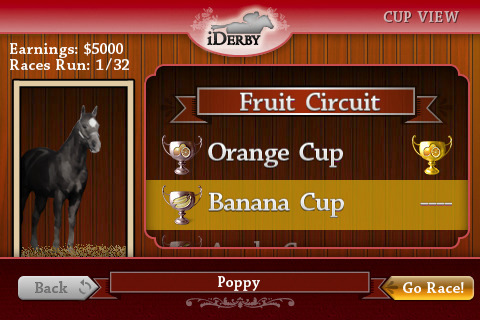 iDerby has got to be the sharpest, most elegant, thoroughbred horse racing iPhone gaming app. The colors, the sounds, the choices and did I mention you can play/race with people all over the world For just $1.99. This is the future people and it looks good, real good and it’s all thanks to the BetTwice Consulting Company for bringing us iDerby. This is my favorite part, in Career Mode, you can select either Edit Jockey or View Stable. I love editing my Jockey! I get to choose from 21 different outfits for my rider to wear during the races. I also get to select which country I would like to represent in the race. So it’s like totally the real horse racing deal. I put my rider in the blue & red heart number & mark that I am representing the United States of America then I click save, simple as that. This takes me back to my options, I now select View Stable. My eyes light up as I see the three beautiful red Horse stables before me. I get to create my very own horses. I can not begin to explain how much this excites me. I love horses, I especially love naming horses. Which is great because that is exactly what they want you to do here. Once you click create, you are shown seven different horses, some of them are what you could call a horse of a different color ha ha, no, but seriously, there are two that are literally a different color than any horse found in nature, hot pink for instance, which I personally ride, or if that isn’t groovy enough for you how about the zebra stripped horse. But don’t worry, they of course have your classic natural colors to choose from as well. I type in the name I have chosen for my noble steed and I finish it off by tapping Create. Then it tells me a little bit about my horse and it’s running style, they also mention how and where it gains the most energy. We are then taken to Cup View, it is here that you can scroll through the different Cups/Races, select the Cup of your choice and then Go Race to win the Cup. In Cup View, a picture of your horse is there along with his stats & Earnings. By Clicking Go Race, it takes you to a race track with other riders and then it’s on! This is the most thrilling part of all, the race. The sound effects and graphics combined create a sense of real competition, The riders are at their marks and they’re off! You can whip your horse to go faster and lean left or right to keep other Jockeys from passing you on the track. My horse has the most energy following other horses so I try to keep him following at least one other guy till the end of the race where I fly by the poor sucker and take the gold right out from underneath him ha ha ha. Yes, well that was the goal at least, at first I would usually come in 8 or 9th place but lately I’m on fire! I’m getting pretty good at keeping the other horses blocked behind me, eating my dust I won 3rd place and made a ton of money. All my races will increase my experience level and unlock different awards. In multiplayer mode it searches for players nearby you who want to race. It’s the coolest thing ever, so even if you have friends you can still have a great time if you play mutiplayer with online fellow racers. Our number are growing so don’t loose faith we can all race together someday. When you open the Feint Dashboard, It’s like your game control center. There is also an Achievements area where you can view your achievements and set new race goals for yourself. A forums & Chat area players can be social and get connected, ask questions post suggestions, all of this stuff is up for discussion here in the Forums & Chat area. They also have a Fan Club area, where you can add the game as your favorite, read the developer Announcements, subscribe to their newsletter or you get really creative and suggest a feature to them. iDerby also has a who’s playing option to click when you want to see which of your friends is up for a race, you can do this easily by importing your Facebook contacts etc. A pretty sweet little game app if you ask me, I love the thrill of the chase and this app satisfies my all my racing adrenaline needs, so game on my friends, game on. Sample the lite version of iDerby on your iPhone for free. 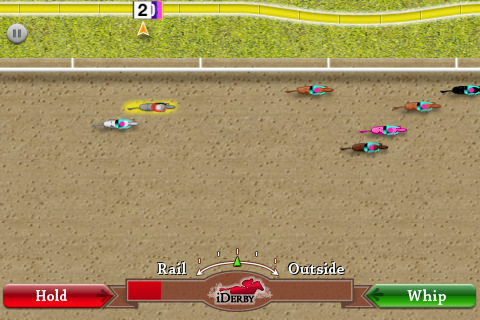 AppSafari review of iDerby was written by Christin Chambers on March 30th, 2010 and categorized under Action, App Store, Fun, Games, Multiplayer, Racing. Page viewed 4044 times, 1 so far today. Need help on using these apps? Please read the Help Page.